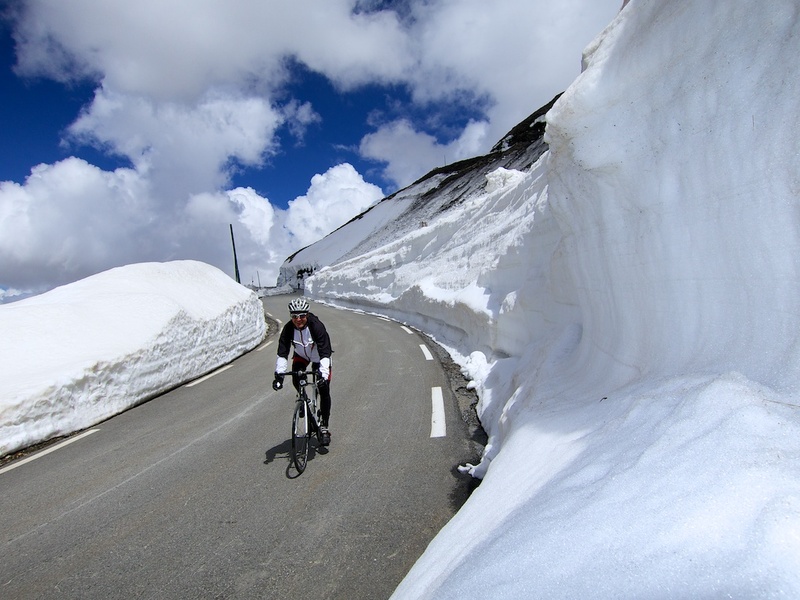 The high Alps passes won’t open for another 6 or 7 months (!) and the snow has now even arrived down low. 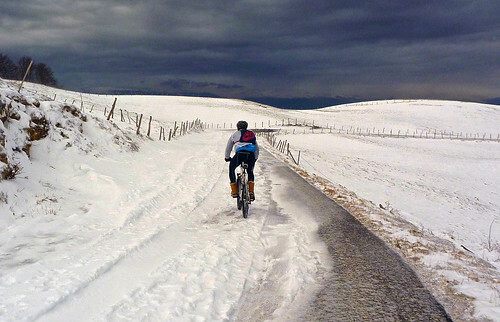 But winter doesn’t mean that one can’t continue to cycle uphill. 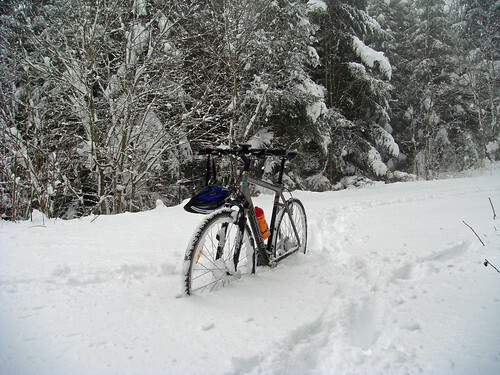 If being frozen solid, miles from home, knee deep in snow with a flat tire doesn’t make you laugh …. perhaps a basement trainer is best for you. 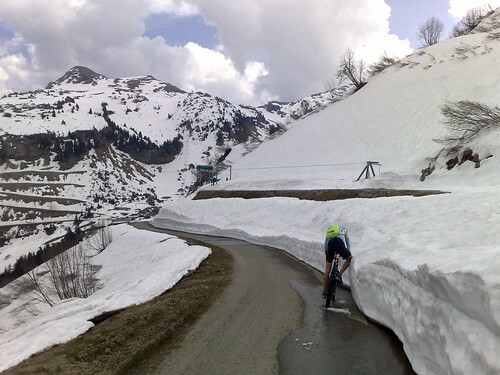 Super long descents in winter conditions while being soaked in sweat from the climb is nothing like just cycing around in the cold. It can be scary, painful, awful. Be warned! 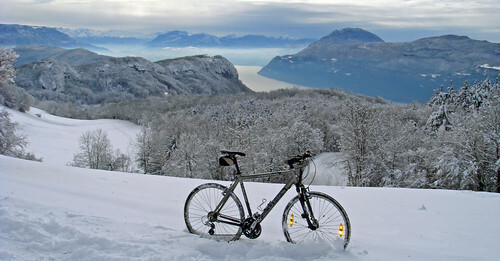 #2 Cycle where the skiers are. 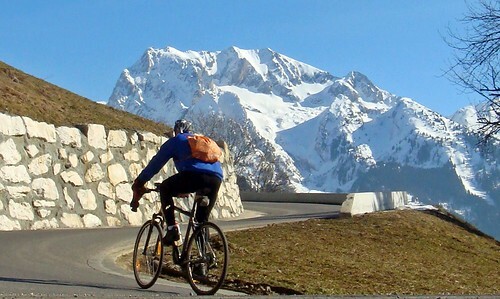 Sure Galibier and most of the high Alps are completely inaccessible. 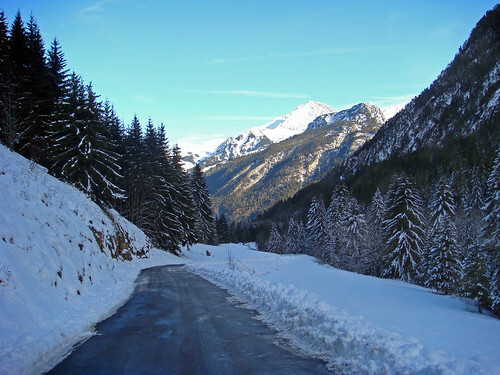 But, roads leading to ski stations get ploughed all winter. 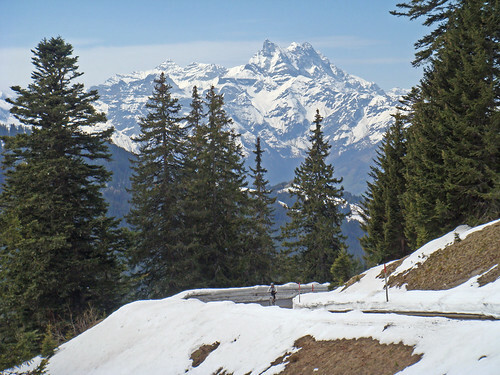 So, for example near Geneva, while the famous Col de la Colombiere (1618 metres) and Col de Joux Plane (1691 metres) will be closed until June – in between these two passes, the much higher Col de Pierre Carrée (1844 metres) is open all year – as it leads to Flaine ski station. 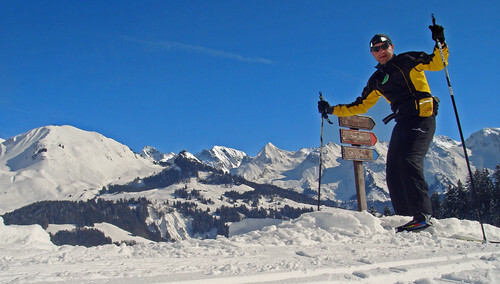 Other quiet nearby climbs leading to skiing (or X-Country skiing): Col des Glières, Col de la Croix Fry, Col des Saisies, Col de la Faucille, Col de Cuvéry, etc. 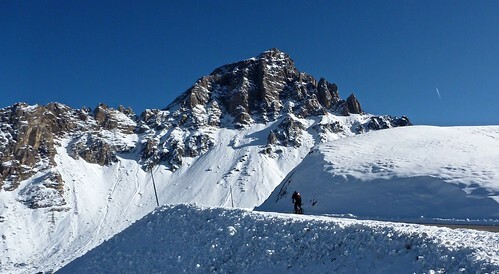 And yes, Alpe d’Huez is a ski station! 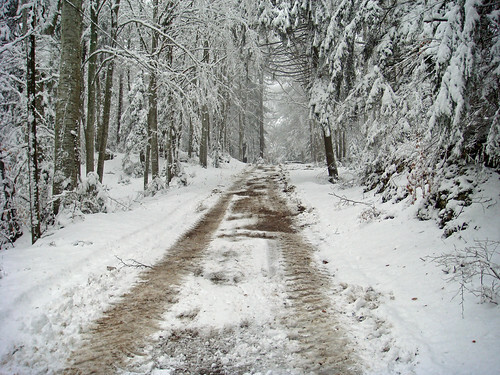 Even when roads are clear and relatively dry, there will often be lots of little ice patches. Descending long climbs on a road bike is crazy. 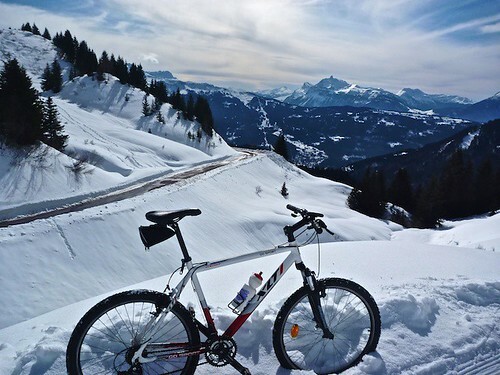 No matter how cold it is, a long climb will keep you warm and soaked from sweat. 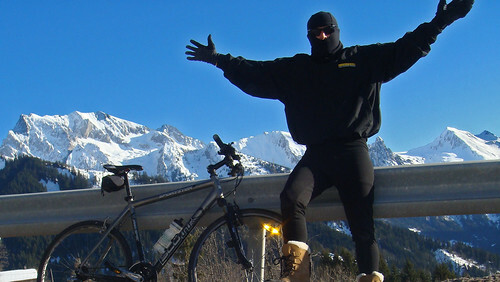 But descending sweaty and even warmly dressed is near suicidal. 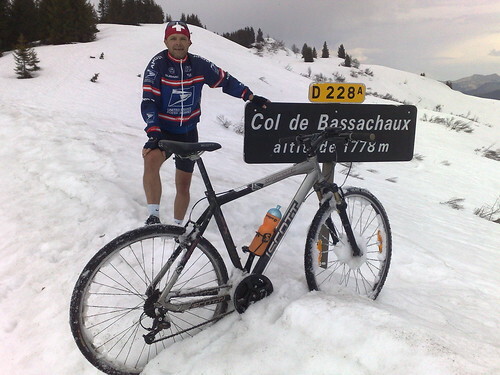 The most important places to overdress is the hands and feet which get very cold very quickly on descents. Torso: 3 layers for ascent. Five for the descent (spares in a backpack). Gloves: Insulated gloves are not enough …. honestly. Wear a second light pair underneath. Footwear: Light socks under ski socks. Gortex shoes and Booties over top. On climbs on snow covered routes, I have gotten into the habit of wearing Sorel winter boots. Heavy, but WARM!. Well worth the extra effort as cold feet are no fun. 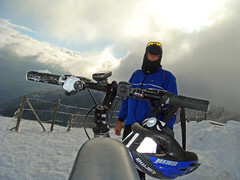 You do not want to hurt yourself in cold conditions. 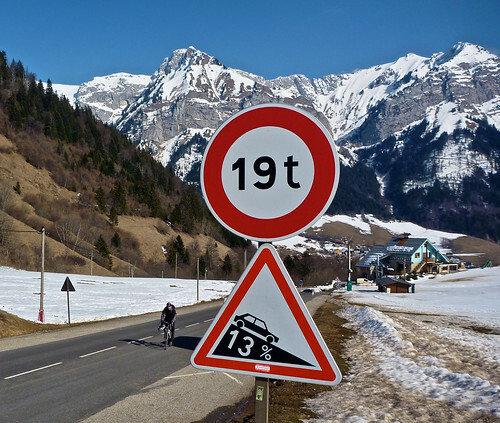 Always wear a helmet on descents. Bring a phone and better yet, bring a friend. 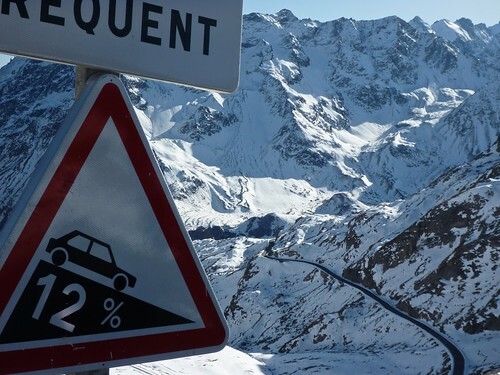 If a descent is too icy, walk. Watch the weather forecast closely. You do not want to be in the wrong place during a snow storm. I also watch the wind forecast very closely as heavy wind up high is just not worth riding in. 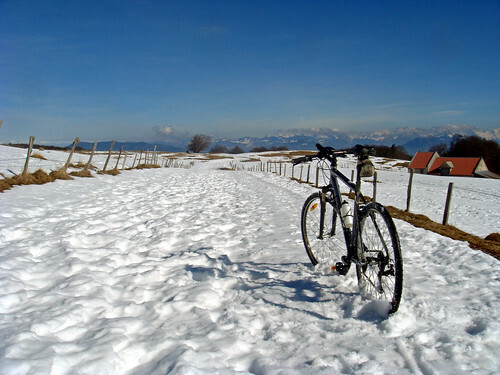 But when the weather is still and sunny, it’s time to ride. 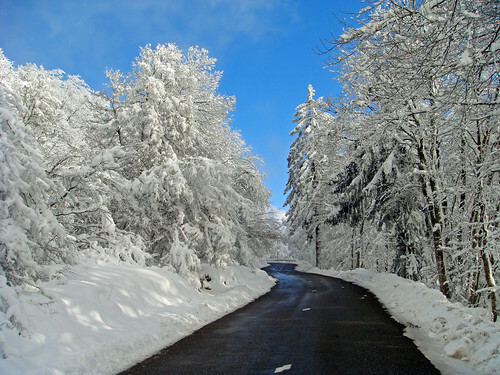 There is nothing more beautiful than being in the mountains on a sunny day in the winter. If All Else Fails Go To Australia! 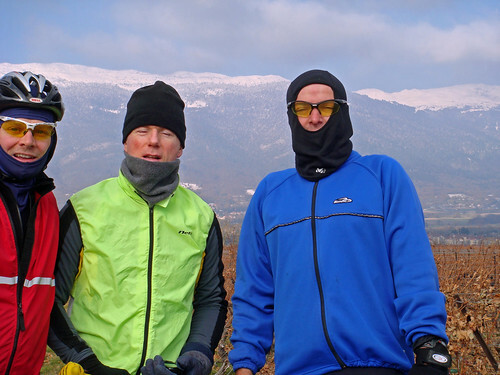 While I try and convince myself (and you) that there is no off-season, one of my regular cycling partners isn’t buying it. Barry (middle) is Busy Biking in Balmy Brisbane, Australia. Psssst – the real secret to winter climbing? Convince someone with a car to meet you at the top! I would agree with your friend Barry. There is definitely an off-season in Brisbane. In winter it gets to chilly 5C (at night!). Temperature is relative. 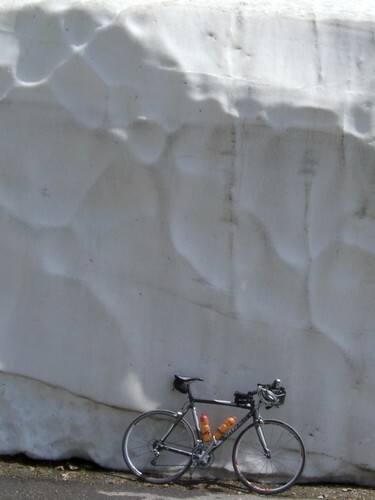 The photo of your bike leaning against the snow wall is definitely worth “Photo of the week”. Love it! your post sent a shiver down my spine just reading it! All I’m doing is joining the hordes of Euros already down here. I even spotted a Gruyere jersey the other day! These are good tips. I learned about freezing on the descent of a local mountain last year, even though it rarely snows in SoCal. 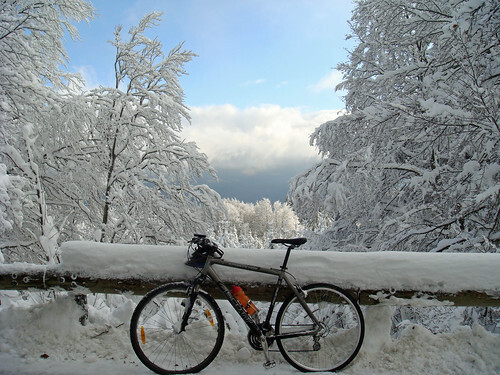 Winter bike it’s so nice (read it n-ice) and reminds me some memorable rides when outside was cold and I felt so good on the bicycle along with my friends! Where did you get your snow boots. 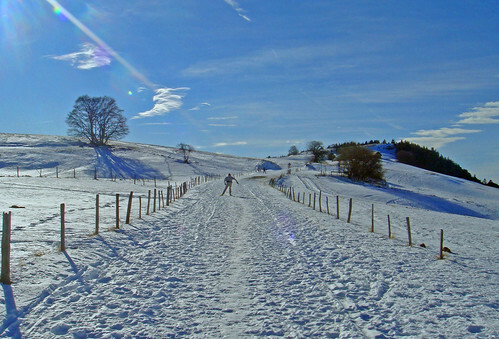 The one outing I had in the snow on the Salève ended being cut short because my (admitedly cheap) snow boots fell apart. The boots in some of the photos are Sorel brand. A famous Canadian brand and warm to -30C! 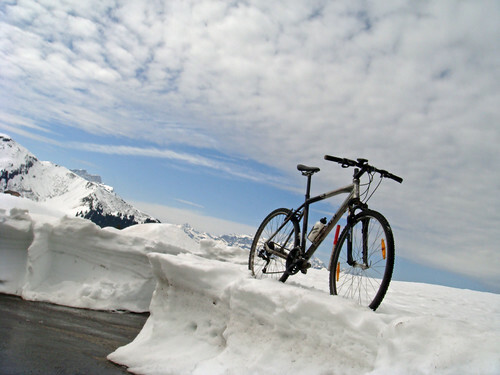 They are fantastic for hiking or snow biking. Tuesday the weather is supposed to tick all your boxes. Let’s go ride in the snow with many layers, boots, hats, gloves and for me…my to be tested hand covers made out of empty plastic coke bottles. Let’s see if descending can finally happen without cursing once the hands start to melt again. 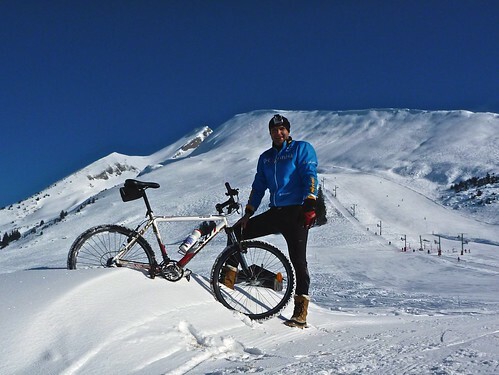 Oh yes, this reminds me : you missed one tip on how to survive cycling in the mountains in the winter : hot soup and grilled cheese sandwich afterwards. Yummy! Love all of it. 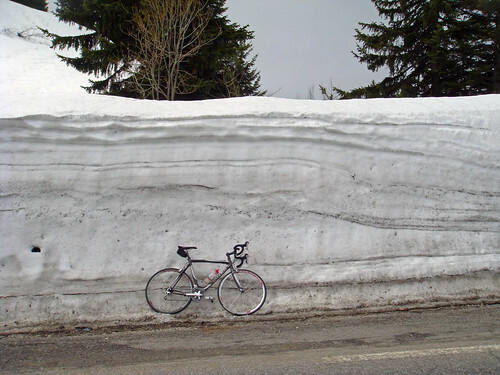 You bring back fond memories of the exhilerating winter climbs I did in Colorado. 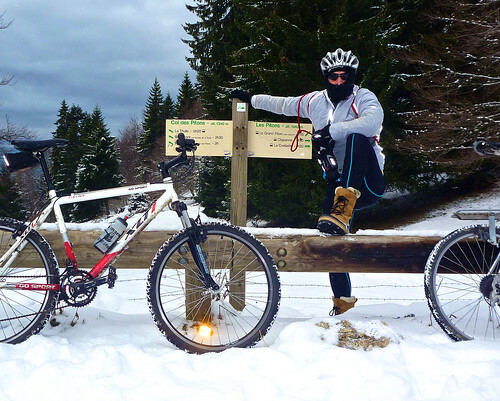 Winter is one of the best times to ride! The solitude is wonderful as is the crisp, clean air. & generally a lot less traffic in the high country. 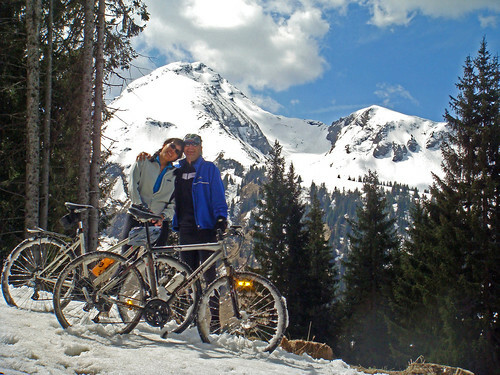 One of my favorite rituals was downhill skiing 1/2 the day at A-Basin Ski Center then hopping on my bike and riding over Loveland Pass at 3654 M (that is not a misprint) down to the Loveland ski resort, turning around and riding back up over the pass again and returning to A-Basin. 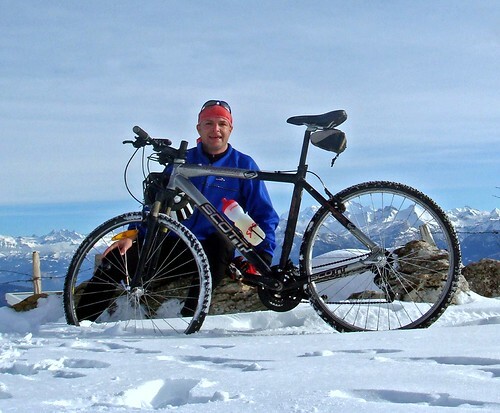 Unfortunately, I did not follow Rule #3 and one year I got caught in a raging snow storm & rode down at about 2 km/h being pelted by snow and ice crystals. Another time, there was a truck accident & they closed the pass to car traffic all together and I had the whole road to myself. Great memories! 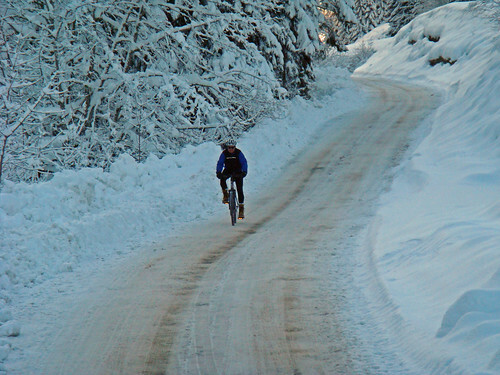 Always overdress, it gives you the added benefit of good padding when you hit that unexpected patch of ice. The rides were always culminated with a high carbohydate, isotonic, malt based recovery drink…or two..or three! One extra thing that I have found useful- studded winter tires. I just got out yesterday around Canmore, Alberta and they work really well on ice. Hopefully, I’ll use them to get out once or twice / week when it is sunny. @Slogfester – On the cold-blooded canadians, it reminds me of a comment from a tour guide operator in the south of Chile. He loved Canadians. They never complained about the cold, cloudy, rainy, stormy weather! – a small 50cl thermos filled with hot coffie or tea. These 2 items can really make the difference when you begin to get really cold !